Is New York’s second banana football team at risk of becoming … popular? The Jets begin this season as a Super Bowl favorite. That in itself is unusual. But there is something even more unusual taking place, something that rarely happens in the world of sports: The team appears to be in the process of upending its identity as a secondary attraction in its own city. As a longtime Jets fan, I know this is supposed to make me thrilled. But the truth is, I feel a bit uneasy. Sportswriters commonly mischaracterize the identity of the Jets, labeling them perennial losers, disappointments, or underdogs. But this isn’t really accurate. During the past decade, the Jets made the playoffs more often than 20 of the NFL’s 32 teams, and they had a losing record just three times. Compare that to, say, the Chicago Bears—not a franchise that anyone thinks of as being cursed—who endured six losing seasons over the same span. It’s true that the Jets haven’t won a Super Bowl since 1969. But 14 teams—more than 40 percent of the league—have never won a Super Bowl at all. 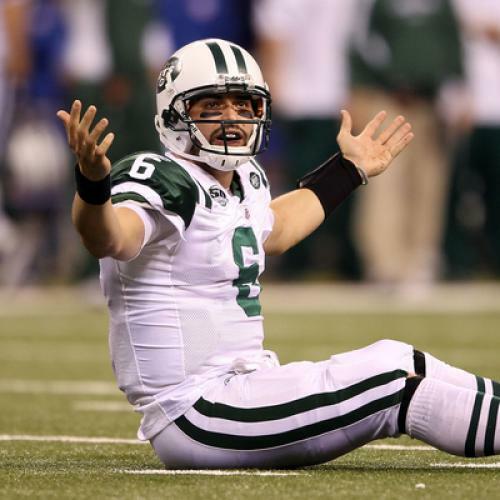 So, if the Jets aren’t really losers, what are they? They are something altogether different: outsiders. To be an outsider is easily confused with being a loser, but it is not the same thing. In sports, it is a rarer identity, and arguably a more interesting one. By definition, the vast majority of pro teams can’t be outsiders because they are the only team that represent their city or state. The Jets, by contrast, are one of a small group of teams—the Mets and the Clippers are also part of this club—who have long been afterthoughts in their own hometowns. But in recent years, all this has begun to change. The New York Times Magazine, in a wildly entertaining profile of Jets coach Rex Ryan, wrote last week that the Jets want to preserve their outsider image, “to still be a team of big men that the little guy from Lyndhurst could love”; but the fact is that many of the team’s major recent moves have, for better or for worse, been out of step with this identity. Owner Woody Johnson’s failed bid to build the Jets a stadium on the west side of Manhattan would have placed the team at the heart of the city while leaving the Giants by themselves in North Jersey. The Jets at the center, the Giants on the periphery—it would have been an exact reversal of the two teams’ longstanding identities. Trading for Brett Favre, a national icon, gave the Jets a lot of cachet in New York, at least for a while. So did drafting Mark Sanchez, whose good looks and charisma made him an instant star in the New York media market. This year brought the acquisitions of Jason Taylor (known for his considerable football skills, yes, but also for placing second on “Dancing with the Stars”) and LaDainian Tomlinson (one of the most famous running backs of his era), as well as the Jets’ decision to appear on the HBO reality series “Hard Knocks.” The result is that, as their season begins tonight, the Jets are not just one of the more talented teams in the NFL; they are also the center of attention in New York. Jets fans’ feelings about all this are likely to be complicated. On the one hand, I suspect most of us have long looked forward to the moment when the Jets would eclipse the Giants in popularity and status in the New York area. What outsider, in any context, does not dream of seeing the tables turned? On the other hand, the outsider label is part of what makes the team special. My dad is a Giants fan; choosing the Jets was an act of early rebellion. Growing up, I knew there were other Jets fans out there, yet I rarely met one because central New Jersey in the late 1980s and 1990s was dominated by Giants fans. To root for the Jets was to be a bit of an outsider; in retrospect, I think that was one reason I came to love the team so much. I would hate to see the Jets lose this part of their identity, especially given the city they represent. New York may be the ultimate insider city—the city of investment bankers and fashion arbiters—but it is also a city of outsiders: immigrants, artists, eccentrics, contrarians. The Jets’ identity has always captured that second half of what it means to be a New Yorker. Fireman Ed, the Jets’ most recognizable fan, and probably the single most famous fan in the NFL, is, in his own way, an artist and an oddball—an angry, bizarre, original creation, a very New York character. Can it really be a coincidence that neither the Giants nor most NFL teams have an analogously strange and prominent figure? Fortunately—despite the HBO show, despite the contracts handed out to high-profile players—the fates seem to be complicating the Jets’ march to a new identity. It turns out that the weakest link on the team is the celebrity quarterback; instead of winning with starpower, the Jets have been winning with a largely anonymous but fearsome defense. Meanwhile, the face of the franchise is not the handsome Sanchez but Rex Ryan—the fat, charming, brainy coach who, before his off-season weight-loss surgery, was reportedly consuming 7,000 calories per day. To be sure, Rex loves the media spotlight—in that sense, he is not a complete outsider. But, with his self-deprecating comments about his weight, his bizarre yet brilliant defensive schemes, and his bombastic leadership style, there is also something about him that is decidedly quirky. Maybe, thanks to him, this year’s Jets will remind the world that it is possible to remain an outsider and still come out on top. Richard Just is executive editor of The New Republic.